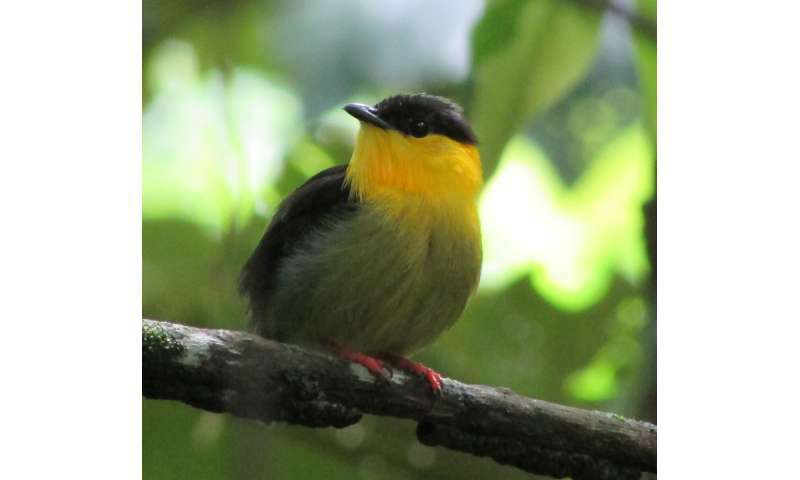 Among the first things that stand out about golden-collared manakins, a bird found in Panama and western Colombia, are the acrobatics of male adults during breeding season. Males also emit a particular call, the 'chee-poo', to attract females. In a new paper published in Animal Behaviour, Smithsonian researchers Ioana Chiver and Barney Schlinger explore the role of androgens—male hormones—in the expression of this vocal behavior, by administering testosterone to females and juvenile males. In previous research by these scientists, testosterone implants motivated juvenile males to perform all the courtship acrobatics of male adults, while females performed some of them. 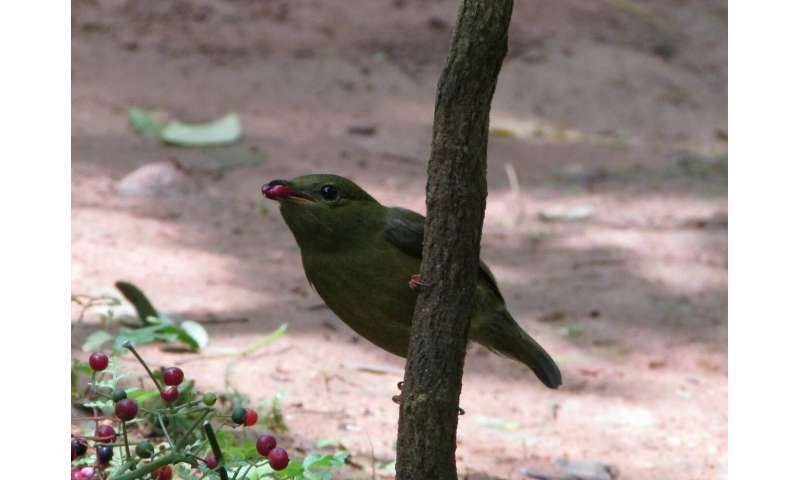 Thanks to video recordings of these behaviors, she was able to extract the vocalizations made by female manakins and juvenile males that were administered testosterone. She then compared them to the vocalizations of untreated females, untreated juvenile males, as well as adult males in the wild. When implanted with testosterone, female manakins were able to produce the male-specific 'chee-poo' vocalization, while untreated females were not. This may indicate that the neuromuscular systems associated with this mating call are present in the females or that they can be quickly developed in response to a male hormone, such as testosterone. As for juvenile males, both the treated and untreated groups produced the 'chee-poo' vocalizations, but their acoustic features were different. The vocalizations of juvenile males receiving testosterone were closer to those of treated females than to those of untreated males or adult males in the wild. They were longer in duration, particularly the 'chee' note, and higher in frequency. "These features make the androgen-activated 'chee-poos' less effective in propagating through the forest than those of adult males in the wild," said Chiver. "There may be different reasons for these variations in vocal behavior, such as lack of practice or mechanistic bases." For females who do not normally produce 'chee-poos', it may involve using certain muscles in a new way. For juvenile males, it could be that the features of their mating call are influenced by practice and social interactions, not just hormones. They tend to observe and imitate adult males from a distance during the breeding season, which may allow them to fine-tune their vocalization as they transition into adulthood. These results also suggest that male and female bird brains are not as different as once imagined. On the contrary, they show plasticity in response to hormones so females can produce behaviors that are usually restricted to males. "Future experiments are necessary, to understand where exactly these hormones act within the nervous system to influence the vocalization changes observed in manakins," said Chiver.